Custom-molded urethane saw blade clamps and jackhammer handle grips capitalize on the excellent vibration dampening qualities of urethane to help prevent tendinitis, carpal tunnel syndrome, and other vibration-related injuries. Urethane parts provide longer service life when compared to plastics and rubber, and lower noise abatement properties when compared to metals. 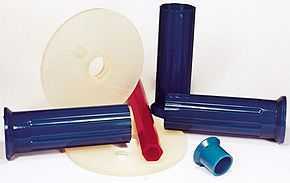 For these and many other reasons product engineers specify urethane components. Whether you are designing a new power tool or need to replace parts for an existing unit, American Urethane, Inc. is the company you can trust to deliver a quality custom-molded urethane part, on time, and at a reasonable price.